Before reading, have a look at the cover. During reading, stop only a few times (and maybe not at all on the first read). Using the visual clues, what are Messy Jessy’s favourite type of muffins? After reading, here are a variety of questions you can discuss with your students. 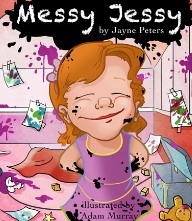 How does Messy Jessy feel about herself? You can spend some time looking at rhyming words and the rhyming pattern in the story.